Trujillo is a nature lover's paradise. It is... a place to hike through the tropical rain forest listening for the telltale crashing high in canopy that signals the approach of a family of monkeys... a place to paddle through the primeval mangrove swamp spotting birds and brilliant butterflies... a place to cool off in the chilling waters of a mountain stream... a place to dine on fresh caught sea food while watching the setting sun turn the skies a hundred shades of red. Trujillo, Honduras' most attractive coastal town, is nestled at the foot of the Calentura mountains on a beautiful sweeping Caribbean bay surrounded by tropical rain forest, mountains, lagoons, and rivers. The beach is palm-lined and the seas are gentle; and best of all, the area has not been over run by tourists. Located on the edge of La Mosquita, the largest rain forest in Central America, Trujillo was once considered too remote for most tourists. Now that the road from La Ceiba, two hours away, has been completely paved reaching this little piece of paradise is easy. 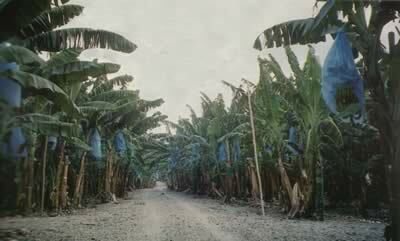 The road follows the mountains and passes endless rows of banana trees. The small tranquil town of Trujillo, one of the oldest in Central America, has played an important part in the history of Honduras. 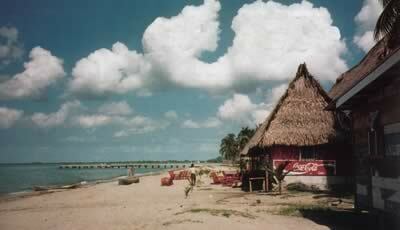 Trujillo is where, on his fourth and last voyage, Christopher Columbus first set foot on the American mainland. That very day, August 14, 1502, the first Catholic mass was celebrated on the spot where he landed. The seat of the Catholic Church remained in Trujillo until 1561, when it was moved to Comayagua. The town itself was established in 1525 by Francisco de Las Casas, who named it after his hometown in Spain. It is one if the earliest Spanish settlements in Central America, and was the capital of Honduras until, in 1537, it was moved inland to Comayagua. In 1880, the capital of Honduras was moved to its present day site of Tegucigalpa. Trujillo's strategic location was protected by several forts. The ruins of one, Fortaleza Santa Barbara de Trujillo, can be visited and explored. 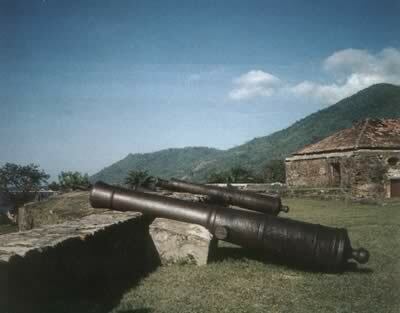 There are several buildings and cannons, but the best reason to visit is the commanding view of Trujillo Bay. Today it is hard to imagine that peaceful Trujillo Bay was, in a bygone era, the site of several hard fought battles. Gold and silver mined by the Spanish in the interior of Honduras attracted many pirates, including the infamous Henry Morgan. In spite of the forts, the town was the site of many attacks. In 1643, it was sacked one last time by Dutch pirates and lay in ruins for nearly one hundred and fifty years. 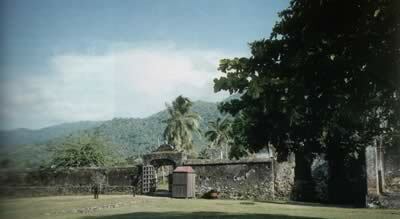 In 1787, the area was resettled, and Trujillo once again became a strategic outpost. The British had established a foothold in the Bay Islands, off the coast of Honduras, and wanted to expand their influence to the mainland. Using Trujillo as a base the Spanish launched their attack against English trading posts in La Mosquitia and in the Bay Islands. In 1869, the bizarre exploits of William Walker, the infamous American filibuster, ended in Trujillo with his capture. In 1855, Walker launched an attack on Nicaragua and for a short time served as the president of Nicaragua. After his unsuccessful but destructive assault on Central America, he landed in Trujjillo and found himself in the hands of the British who turned him over to Hondurans. He was tried and executed by a firing squad on September 12. Near the fort a monument commemorates the event; however, he is buried in the local cemetery. A tour of Trujillo should start at the shady, attractive central plaza. Facing the plaza is the church, governmental offices and shops. The streets are perfect for strolling and soaking up the ambiance of the town. A series of small open air restaurants line the beach area. The best view in town is from the Villa Brinkley. It is well worth the climb up the steep roadway. 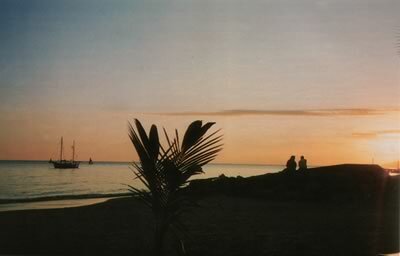 Stay for dinner, the meals are excellent, and watch the sun set over Trujillo Bay. On the edge of town is a private museum, The Museo Arqueologico, with a unique and eclectic assortment of new and old items; some real, some fake, some of interest, some absolutely no interest. An impressive collection of Mayan stone carvings is not far from a bottle of water used by American soldiers in the Desert Storm conflict. Near the entrance are the remains of an American C-130 Hercules in which several Americans lost their lives when it crashed in the bay in 1985. Behind the museum, the owners have diverted the waters of the river to create several swimming pools and a recreation area. About 2 miles out of town on the road Santa Fe, a small Garifuna village, is a place that can not be described without using the word paradise. A short walk up from the main road on the Rio Grande the water tumbles over the rocks into a crystalline pool. The urge to jump in can not be resisted. Swimming in the refreshing cool water of the stream in complete solitude with the lush tropical growth soaring along the shore makes one appreciate the majesty of the tropical rain forest. Further up the stream are a couple of even more remote and private swimming holes. A short distance form Trujillo, the Guaymoreto Wildlife Reserve protects the fragile mangrove habitat. 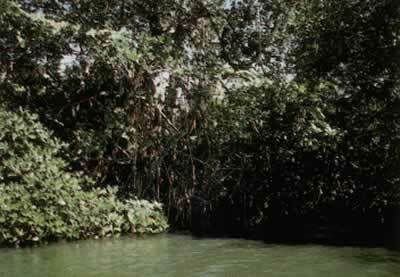 The primeval looking mangrove tree creates the perfect environment needed as a breeding area and nursery for birds and fish. It is truly a bird watcher's paradise. Near the Chapagua River, is one of the most exotic reserves in all of Honduras. Here, the teal waters of an oxbow lake provide a habitat for 70 crocodiles. 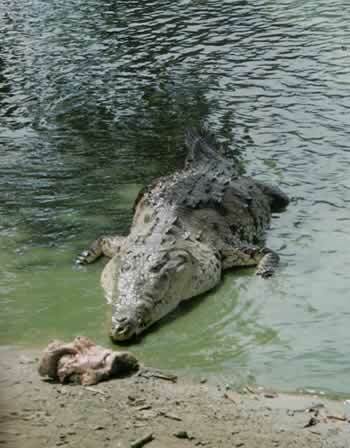 Because the area is protected and the crocodiles are fed, they have grown to huge proportions. This is an up-close and personal exposure to the habitat of the crocodile in its natural habitat. 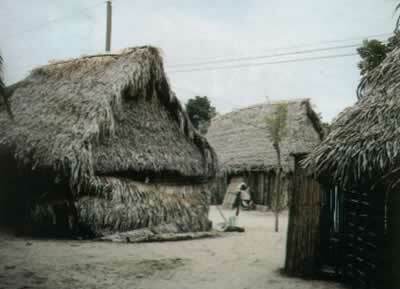 A stay in Trujillo would not be complete without a visit to one of the Garifuna villages. The Garifuna, descendants of shipwrecked African slaves, have retained their unique culture. They are noted for their excellent cooking, their energetic "punta" dancing, and their good nature. The most striking quality of a Garifuna village is the view. Each village is on the beach nestled under the swaying palms. The best way to experience the lifestyle of the Garifuna is to walk the beach from village to village. Several of the tour agencies have walking tours that include a typical meal, boat transportation part of the way, and a refreshing swim. One should not leave Honduras without sampling "pan de coco' (coconut bread) and tasting the fish dishes cooked Garifuna style with coconut milk. On the weekends the Garifuna can be seen dancing in one of the champas in barrio Cristales. The drumming and dancing will bring to mind their African heritage. Side trips to a working ranch and a banana plantation help one to understand the economics of the area. On, Cabo de Honduras, the arm of land that protects Honduras is Puerto Castilla, one of Honduras' major ports. It is here that the fruit companies ship bananas and pineapples throughout the world. The usually sleepy town of Trujillo comes alive during Semana Santa, the annual festival honoring the town's patron saint. The feast day for Saint John the Baptist (San Juan Bautista) is June 24 but the celebration goes on for a week. Trujillo, with its pristine palm-fringed beaches, is an exciting blend of Spanish, Latin, and Afro-Caribbean cultures. It is an excellent place to become acquainted with the flora and fauna of the tropical rain forest. It is a place to renew the spirit and shed the pressures and cares of the work-a-day world. Just slow down, relax, and enjoy...you're in Trujillo.